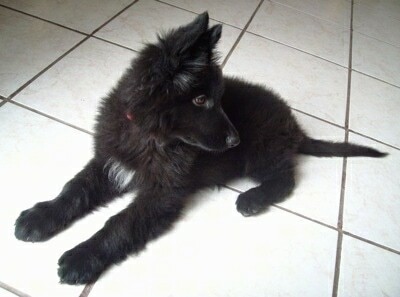 "Emma, our black GSD at 2 years and 6 months old. Thank you for the dog knowledge you shared with us. I see the fruits of it every single day in our dear Emma." "Emma the black GSD at one year old (we think her birthday is about the 15-19 June)—I couldn't be happier with this dog. Every day I realize that all the time I invested in training her since the very first day she came has been more than worthwhile. Every single day we go run 6 Km at 6:30 in the morning. I am training her to search and find hidden objects on command and from time to time, when we walk in a trail with the kids, they hide and I make her find them on command. I love the idea of training her for search and rescue." 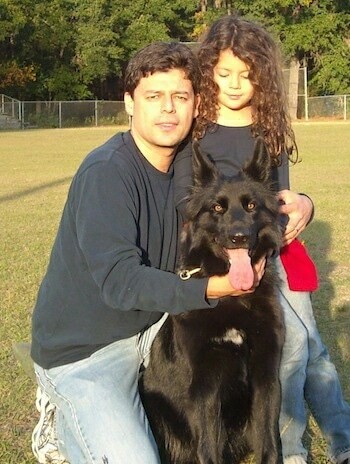 "Emma the black, longhaired GSD at 11 months old turned out to be a very gentle and sweet dog. Very obedient and trainable. Emma is being fed only raw meat of all kinds (beef, marrow bone, sardines, tuna, lots of chicken, tripe), cottage cheese, yogurt and some veggies, no dry food at all. She is doing great, I love to prepare her food. Feeding her is not an extra job, we just give her what we happen to have in the fridge and keep her diet balanced, just as another family member!" "Emma the black GSD is chewing a bone at the same time my daughter Lia is using her as a pillow. Anyone of us can literally stick our fingers in her mouth while she is either chewing or eating from her plate, without a single complaint/growl." "I just wanted to say thank you very, very much for the information on your site, especially the "Raising a puppy" pages. We rescued Emma, a black, long-coated GSD at 5 weeks of age that was in very bad shape: thin to the bones and full of worms. She is now 12 weeks old and since day 1 we were very strict about proper crate training (and yes, a couple of weeks of sleepless nights for me), the sitting and waiting ritual at feeding time and before coming in and out the house to the garden. Even though she was in a very bad shape, thanks to all the info from your site we offered her leadership and clear rules before affection. By the end of the first week she would pee on command, and do the sit-stay-come exercise. She's never peed inside her crate. 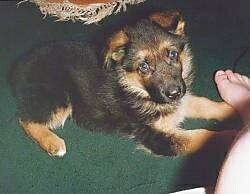 Only once when she was 6-7 weeks old she barked at our kids (Lia, 5 and Daniel, 7) in a dominant tone. I was very close so I was able to correct her immediately. Since then I frequently make the kids feed, touch her and her food while she's eating and practice the sit-down-stay-come exercise. No more signs of dominance. Now that she's done with her shots she walks and runs with my wife and me daily and walks very nicely without pulling and accepts our lead very nicely. The only quirk with this puppy is that she likes poop! I ruled out parasites and bad nutrition, it's just that she likes poop, after all, she's a dog. After reading some of Bruno the Boxer's stories I was relieved. Less and less often do we see her attracted to the poop and hope she'll outgrow this behaviour. We get to practice often the "Drop it!" command, as she is fond of ours shoes and sandals. Thanks to your site we also decided to keep our bedrooms and the play room off-limits. 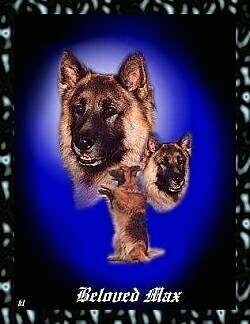 Besides preventing dominance problems, that also eases the challenge of having small kids and a GSD, a 24/7 job! Now I wouldn't recommend getting a dog until the kids in the family are very well informed and able to be consistent, very consistent with rules. I'm a stats professor at a local university here so I have a very flexible schedule and also can work from home which has definitively helped. Some GSD websites actually encourage the dog sleeping in your room, contrary to what your site recommends (and other nonsense things like choosing a dominant puppy from the litter), but admittedly, that was a little too much for us." 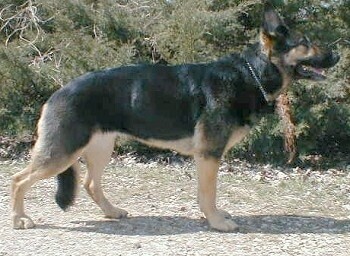 "Jake is an 11-month-old German Shepherd. He is an only child to a military family stationed in Guam. Jake has a friendly and inviting personality and is always willing to give hugs to those who need them the most. He is the most popular dog on the block, and is known to be "the human dog." He loves to dance, eat, the San Diego Chargers, and most of all, his dad who he misses dearly because he is serving in Iraq right now." 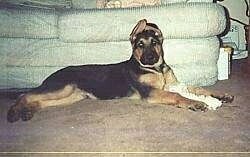 "I got Duchess in February 2006 when she was 3 ½ months old. 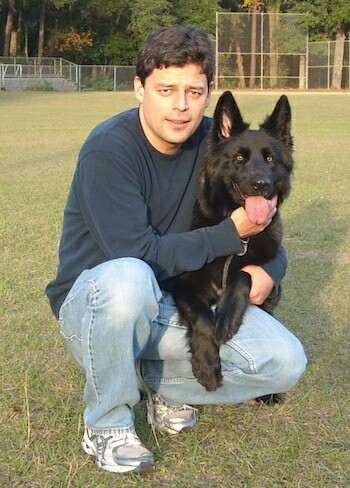 She was a purebred all-black German Shepherd that I purchased from a breeder. 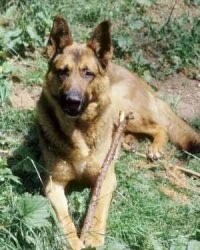 Duchess was a wonderful dog. She loved cats but they didn't quite love her. 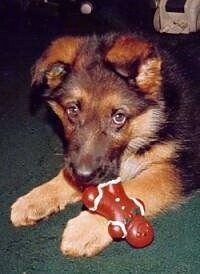 She wasn't really a "ball" dog; she'd rather chew on things like bones and the family’s shoes. 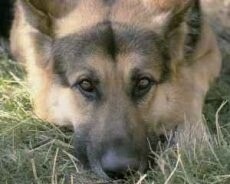 Sadly, in February 2007, I lost Duchess. 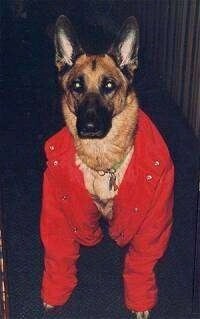 Tragically, my house was broken into and my two dogs (Duchess and my other 1-year-old German Shepherd Tyco) were let out. I found Tyco the next day in the pound and quickly made posters the third day to find Duchess. Unfortunately, three hours after 60 posters were posted a lady called stating she had seen the dogs together, and Duchess had run into the street (as the police tried to capture her) and got hit by a car and didn't make it. I was heartbroken and still am. I would love everyone to know how much she was loved and is MISSED!" This is 8-week-old Skye. 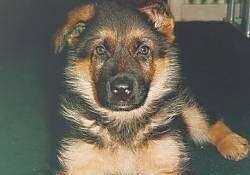 His pedigree name is Leynosk Deboniar. 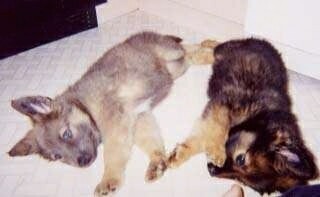 Kiko (left) and her litter mate. 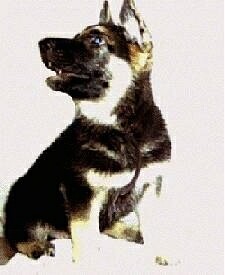 Kiko is a blue German Shepherd puppy.